The United States has not entirely ignored the suffering in Darfur. Over three years of genocide, our government has sent close to $800 million in humanitarian aid to refugees, given a modicum of support to African Union (AU) peacekeepers, and occasionally pushed—though not necessarily enforced—punitive resolutions at the United Nations. By the standards of the international community, this counts as a robust response. But, by any serious moral standard, it does not. The sad fact is that the Bush administration has had opportunity after opportunity to crack down on the Sudanese government and stanch the genocide. Instead, it has chosen a path of "constructive engagement" that has permitted the slaughter of hundreds of thousands. If we failed to intervene in tiny, impoverished Rwanda because no strategic interests were at stake, Sudan now has the opposite problem. It is the largest country in Africa, with extensive oil reserves and a history of support for terrorism, making it inherently important. Unfortunately, our interests there "cut on the side of not offending the regime in Khartoum," according to Donald Steinberg, a senior State Department official under Powell. The administration treated the Darfur genocide not as an outrage, but as just another part of its strategic calculus. As a result, it shied away from sanctioning Sudanese officials, upgraded Sudan's counterterrorism cooperation and human rights standing, and even flew one of the genocide's architects to Washington in a private jet. When history judges the Bush administration's policy on Darfur, it will summarize it in one word: appeasement. In October 2003, Powell traveled to Kenya to deliver a pep talk to Sudanese government officials and rebels from the Sudan People's Liberation Movement (SPLM), who, at long last, appeared to be nearing a peace agreement. For 20 years, the government in the Muslim North had been at war with the Christian and animist South. Represented by the SPLM, the Southerners complained of political and economic marginalization by Khartoum and the imposition of sharia law. In 2001, the Bush administration had taken over mediation of the peace talks, using the prospect of normalized relations with the United States as a motivator for the long-sanctioned Sudanese government. As Powell landed in Kenya, which had been hosting the negotiations since 1993, it seemed that years of diplomacy might finally produce peace. "There's a lot of work ahead, but, frankly, we're getting closer," he said. "Now that we've come this far, let's finish it, let's kick it in, let's throw it into high gear." But, as peace neared in one part of Sudan, another was plunging into violence. Just a week after Powell's visit, Andrew Natsios, head of the U.S. Agency for International Development (USAID), made a separate trip to Sudan, during which he spent two days in Darfur. Natsios, a former Massachusetts politician with a full moustache and a less-than-full head of hair, had spent time in Sudan before, as a USAID official under George H.W. Bush. Still, on this trip, he recalls: "I was sort of stunned by what I found." When the 100-degree heat cooled with the setting sun, Natsios joined the governor of Northern Darfur on the lawn of his residence for a Ramadan feast under the stars. During a meal of figs, nuts, lamb, and goat, he met various members of Darfuri civil society. And every one of them—the women in vibrant dress, the men in thin white robes—spoke about attacks by the Janjaweed militias. "I had never heard of the Janjaweed before," Natsios says. "But it was very clear [they] were upset about this." American officials say it took some time to fully grasp what was going on in Darfur—the scale, the ethnic dimension, the Sudanese government's orchestrating role. In early 2003, two rebel groups from ethnically African tribes had emerged in Darfur, complaining that their region had been marginalized by the government in Khartoum. Their grievances were similar to the South's, although, here, all parties were Muslim. After the rebels attacked a military airfield in April, Khartoum fought back, targeting rebels and their tribesmen alike. Manipulating local resource conflicts between African farmers and Arab herders, the government was able to recruit the nomadic Janjaweed as its henchmen in what became a massive and brutal campaign to stamp out the Fur, Masalit, and Zaghawa tribes. In the fall of 2003, however, much of this was hazy, and its effect on U.S. policy was limited to a talking point in meetings with Khartoum. But, by December, U.N. Emergency Relief Coordinator Jan Egeland was calling the humanitarian situation in Darfur "one of the worst in the world." It was clear the U.S. government would have to make a choice: push ahead on the North-South peace talks in Naivasha, Kenya, or push for an end to the violence in Darfur. "The tension that would arise," explains one former government official, "would be, ‘How can one engage the government in the North, in some way, given the atrocities in Darfur? Yet, at the same time, if one doesn't engage them…the peace process in the South potentially falls apart.'" Making sure that the North-South process didn't collapse was politically important to the Bush administration. The conflict was that rare African crisis that actually had a domestic constituency: American evangelicals, who were outraged by Khartoum's treatment of Sudan's Christian community. Indeed, among evangelicals, traveling to Sudan to witness the persecution of Christians and deliver relief became a sign of discipleship. And, at home, a grassroots group—including an alliance of churches in Bush's hometown of Midland, Texas—formed to lobby on behalf of the South. That group included Franklin Graham, son of the Reverend Billy Graham and president of the Christian relief organization Samaritan's Purse, who secured a promise from Bush in 2000 that he would do something about Sudan if elected president. And, once in the White House, he did. In 2001, Bush appointed Episcopal minister and former Senator John Danforth as his special envoy for peace. And the administration began to look forward to the end of Sudan's civil war as a prize it could win for its Christian base. Combined with an understandable desire not to imperil the conclusion of one of Africa's longest-running conflicts, this political impulse led American policymakers to decide in early 2004 that they would try to finish the North-South deal before turning to Darfur—even if it meant ignoring a genocide. Their rationalization went like this: The North-South agreement was grounded in core principles about sharing power and wealth that Darfuris could then use as the foundation for a peace agreement of their own. The North-South agreement would also dilute the extremist regime in Khartoum by integrating Southerners into the national government and creating a new order more sympathetic to Darfuri concerns. Lastly, the agreement called for democratic elections in 2009, which would give President Omar Al Bashir and his National Congress Party an incentive to promote peace and prosperity in the whole country. This approach served the administration's political interests, but it was a fatal miscalculation—"a way to interpret the status quo positively," as Gayle Smith, an Africa specialist at the Center for American Progress and onetime director of African affairs at the National Security Council (NSC), puts it. For one thing, the agreement was very specific about the division of power and resources between the North and South. To subsequently incorporate other parties and regions would require difficult renegotiation. For another, even if more Southerners joined the government, it was not at all clear that they would be able to quell the violence in Darfur. Many of the same ruthless figures—like Bashir, who had taken power in a 1989 military coup—would still be in charge. Finally, while a gradual transformation might be the most effective way to transition from dictatorship to representative democracy, it does little good during a genocidal emergency, when each day of delay equals another day of death. Darfur couldn't wait for such roundabout assistance, and, throughout the spring and summer of 2004, the genocide became increasingly hard to ignore. Within the U.S. government, Natsios and his deputy, Roger Winter, were pushing hardest for Darfur. In April, Natsios dispatched a Disaster Assistance Response Team to assess the situation and facilitate the delivery of aid. He commissioned commercial satellite photographs to capture before-and-after images of villages that were being destroyed. And he launched a scientific study to project mortality rates. On June 3, at a U.N. meeting in Geneva, he went public with the results of that study, warning that 300,000 to one million people could die. His efforts were most effective in prompting a response to the humanitarian aspect of the crisis. Usaid was authorized to deliver food, and, when the Sudanese government obstructed access, playing games with visas and blocking convoy routes, Bush and Powell conveyed their displeasure to Bashir and Vice President Ali Osman Mohammed Taha. The tenth anniversary of the Rwandan genocide in April 2004 also focused public attention. It was difficult to talk about Rwanda without also mentioning Darfur, and so, on April 7, Bush released his first statement on the atrocities, declaring, "The government of Sudan must not remain complicit in the brutalization of Darfur." Later that spring, in a phone call with The New York Times, Powell said that the administration was considering declaring the atrocities in Darfur genocide. And a State Department spokesman confirmed that a genocide finding "would trigger, at a minimum, the need…to hold those responsible accountable." Yet making such a finding took months. And, in the end, Powell dashed any hopes of more concerted action, telling the Senate Foreign Relations Committee, "We have been doing everything we can to get the Sudanese government to act responsibly." That wasn't true. In fact, in 2004, the Bush administration missed several opportunities to take on a more active and effective role in ending the violence. In late summer, representatives of the Sudanese government and Darfur rebels began peace talks in Abuja, Nigeria. But, in contrast to the North-South negotiations in Naivasha, where the United States was the dealmaker, this time Washington decided to stay on the sidelines and let Nigerian President Olusegun Obasanjo and the African Union mediate. "They were trying to establish their peacekeeping abilities," one senior American official explains. "They were very sensitive about us having been the ones at Naivasha." Within the State Department, some policymakers argued that the African Union didn't have the leverage to make the negotiations work. The United States didn't have to take credit, they said, but it needed to be the one doling out sticks and carrots behind the scenes. Ultimately, though, the sensitivities of the African Union won out over the needs of Darfur. There was similar talk about "African solutions for African problems" in the context of a peacekeeping force. The African Union, established in 2002 to replace the failed Organization of African Unity, had only intervened militarily in one other conflict, and Darfur was framed as an opportunity for Africa to prove it could police itself. AU troops were more acceptable to Sudanese officials—in no small part because Khartoum knew the young AU would be less effective than Western troops. Even so, that summer Sudan would only allow a force of unarmed observers charged with monitoring a meaningless cease-fire and a 300-strong "protection force" permitted to protect observers but not civilians. Meanwhile, the World Health Organization estimated that between 6,000 and 10,000 Darfuris were dying each month. The United States eventually did support the African Union in bumping up troop numbers, pressuring the Sudanese government to agree to 2,000 troops that fall and 7,000 the following spring. But that is still far below the 20,000 troops the United Nations estimates are needed. Moreover, the African Union never got the backing it sought for a "full-fledged peacekeeping mission." As far as the United States was concerned, a stronger mandate would require more resources, and, given our commitments in Iraq and Afghanistan, those were resources the Defense Department was reluctant to give. "There was almost a sense of wishful thinking that the African Union can fix things by deploying troops," concedes the former American official. "There was absolutely no way that that level of presence really could have made a difference on the ground, given the number of displaced people, the size of the area, the violence that was taking place. And all of us at that stage should have stepped back and said, `This is way too inadequate—we need a major international effort in order to get this done.'" But the Bush administration was not willing to push for a major international effort of any sort. A U.S.-sponsored Security Council resolution adopted on July 30, 2004, threatened to "consider further actions," including economic sanctions, if the Sudanese government didn't progress on disarming the Janjaweed within 30 days. But there were no consequences when Khartoum missed that deadline. The Security Council merely resolved to consider unspecified "measures" at an unspecified time in the event of noncompliance. It wasn't until the following March, after Condoleezza Rice had been made secretary of state, that the United States drafted a resolution imposing a travel ban and asset freeze on individuals responsible for the continued violence. And it was only last week that the first sanctions actually came down, targeting Janjaweed militia coordinator Musa Hilal along with a former military commander and two rebel leaders. So far, though, Sudanese government officials have gotten off scot-free. To be sure, China, which is reluctant to compromise its oil interests in Sudan—and to a lesser extent Russia, which is loath to invite scrutiny of its own behavior in Chechnya—are major obstacles at the Security Council. But the United States didn't do all it could unilaterally, either. Though our existing trade restrictions on Sudan limit how much more economic pressure we can put on the country, Washington could do more to target the individual perpetrators of the genocide. For example, President Bashir and Vice President Taha have not been added to our list of Specially Designated Nationals and Blocked Persons. At the very least, individual sanctions would signal a level of U.S. seriousness. "In the absence of doing that," Steinberg says, "we have suggested that we have higher priorities." Those priorities have varied across the U.S. government, but they have all led to the same place: appeasement. In April 2005, a CIA jet landed on the tarmac in Khartoum, and Salah Abdallah Gosh, a chubby, bespectacled Sudanese official, got on board. As Sudan's national security chief, Gosh had been cited by Congress in 2004 for having played a key role in orchestrating the Darfur genocide. But the CIA was interested in him for a different reason. In the early '90s, when Osama bin Laden and Al Qaeda were using Sudan as their base, Gosh was the intelligence officer tasked with keeping tabs on them. Today, Gosh oversees Sudan's intelligence service, the Mukhabarat. The CIA brought him back to Langley, as its guest, to talk terrorism. The Sudanese government once possessed valuable terrorism intelligence—because, for a number of years, a number of terrorist outfits operated out of Khartoum. And, after September 11, when it feared it might become a target in the war on terrorism, Khartoum began sharing that information. The Los Angeles Times reported in April 2005, for instance, that Sudanese intelligence have detained Al Qaeda suspects for interrogation by American agents, turned over passports and other evidence recovered in raids on suspected terrorists' homes, and expelled extremists from the country. The State Department's most recent report on global terrorism declares that "Sudan's overall cooperation and information sharing improved markedly and produced significant progress in combating terrorist activity." Yet a senior government official says Sudan's intelligence is no longer that valuable: "No, not anymore. The motherlode? We got that in 2003. We didn't get it lately." Gosh's visit to Langley, the official says, wasn't expected to produce useful information. It was a symbolic move intended to demonstrate appreciation for past cooperation and to preserve the relationship. A desire to preserve our relationship with Khartoum has led the State Department into similarly compromising positions. In May 2004, it removed Sudan from the list of countries not cooperating on counterterrorism, although, illogically, Sudan remained on the separate list of state sponsors of terrorism. (State Department spokesman Richard Boucher lamely explained that we were trying to "offer positive enforcement.") Last year, it improved Sudan's status on the human trafficking watch list, though Sudan had made no significant progress on the issue. State also undercut U.S. sanctions when it allowed Khartoum its own p.r. consultant: Washington lobbyist Robert Cabelly, who was given a $530,000 annual contract—until congressional pressure forced him to terminate the deal in February. Sudanese Foreign Minister Mustafa Osman Ismail was granted an audience in Washington with Rice, who, Ismail reported, promised to review the remaining sanctions. And Rice's deputy, Robert Zoellick, led a U.S. delegation to Sudan's presidential inaugural. All of this has gone on even as the Sudanese government has continued to coordinate attacks on civilians and has not even pretended to rein in the Janjaweed. But the State Department has been reluctant to upset the North-South accord. "You were constantly trying to play this balancing act between how tough you get on Darfur, and press them on Darfur, but still keep them engaged to meet their part of the bargain in the South," the former official says. When members of Congress, in the spring and summer of 2005, proposed several versions of a Darfur accountability act, the State Department pushed back, arguing that Congress would constrain its negotiating position and wasn't sufficiently recognizing Khartoum's cooperation in the South. One senior government official recalls telling members of Congress that "this is all well and good. This makes you feel good. This makes it almost impossible for us to get a reasonable deal. We have shown these guys absolutely nothing." Some government officials argue that it was a mistake not to move even further toward normalization. "If somebody ever sits down and writes the book on this, and this doesn't end well," says the senior official, "we'll have lost this because we lost the peace faction in the North. And we lost the peace faction in the North over not giving them anything for what they'd done." Of course, we have given Khartoum many things—concessions that it has simply pocketed as it continues to prosecute the genocide. And the United States has tolerated this horror while getting little in return. Sudan's counterterrorism intel is not helping to save lives, while the State Department's precious North-South accord, signed in January 2005, is not proving particularly successful. Although the violence has ebbed for the moment, there has been little progress on the power- and resource-sharing arrangement. Bashir's National Congress Party still holds the major Cabinet positions and refuses to share oil-production information, let alone much revenue. This week, finally, the State Department sent Zoellick to twist arms at the AU-mediated peace talks. And Bush urged Bashir to reach an agreement with the Darfur rebels. It is unclear if this pressure will yield results. 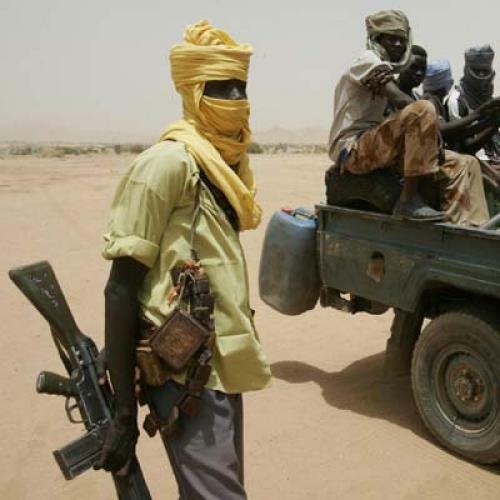 The Sudanese government has promised to disarm the Janjaweed several times before. All the same, it is pressure that should have been exerted all along. Instead, the United States has repeatedly undermined even its most promising moves. After Bush spoke in February of bolstering NATO involvement in Darfur, administration plans called for sending fewer than 500 advisers—and then only to help at AU headquarters, not in field operations. Likewise, though the Bush administration pushed last month for a U.N. resolution imposing targeted sanctions on those responsible for the Darfur atrocities, it fought to keep Gosh off the list. Ironically, although in Rwanda it demonstrated precisely how not to stop genocide, the Clinton administration's hard-line approach to Khartoum offers a model for how to deal with Darfur. Concerned about terrorism in the mid-'90s, Clinton broke off relations, imposed a series of sanctions, and got Sudan to expel bin Laden in 1996. John Prendergast, an African Affairs director on Clinton's NSC, laments that Bush's constructive engagement has turned those lessons upside down: "Instead of dealing with [Khartoum] with pressure, with isolation, with demonstrable penalties for the commission of crimes against humanity, we're coddling them; we're having tea with mass murderers." The Bush administration's legacy in Darfur will be a fight against a genocide that protected the genocide's architects. Which is not much of a legacy at all.